Urban forests are infrastructure assets in Ontario communities that are chronically underfunded and lack support from higher levels of government. 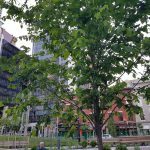 The Green Infrastructure Ontario Coalition is urging the Province to work with us in developing an Ontario-wide urban forest strategy. We are working toward this goal through provincial outreach and education. GIO’s urban forestry toolkit is a set of documents that support those working to improve urban forest management across the province. This toolkit builds upon our 2015 report Ontario’s Urban Forests: Call to Action and was developed with input from professionals around the province. The first piece of the toolkit can help build the case for the value that urban forests provide as a municipal asset – with the goal of integrating urban forest management into municipal asset management plans. Read the bulletin on communicating the benefits of the urban forest in a municipal context HERE. The second document in our toolkit helps urban forest managers understand how urban forest assets fit into the municipal asset management planning process. 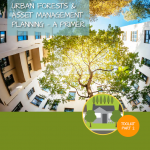 Read the urban forest asset managment primer HERE. GIO hosted several urban forest asset management workshops in the fall of 2017 to help build a common understanding of best practice in this emerging field. Experts and urban forest managers presented best practices and case studies from local leaders. See the presentations HERE. 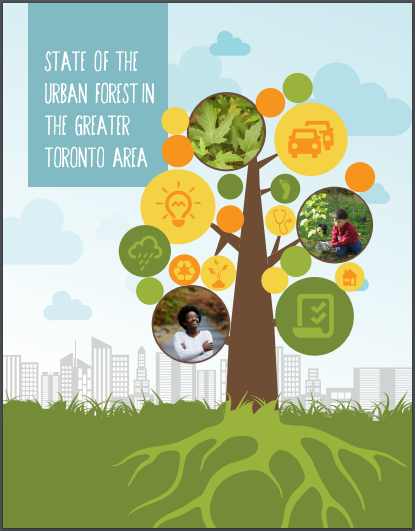 GIO’s State of the Urban Forest in the Greater Toronto Area report is a landmark effort drawing on data from 17 municipal and regional governments in the Greater Toronto Area to provide a comprehensive overview of the local urban forest. The report identifies the key benefits of the urban forest and outlines the challenges and opportunities associated with maintaining and growing this vital resource. Read the full report HERE. 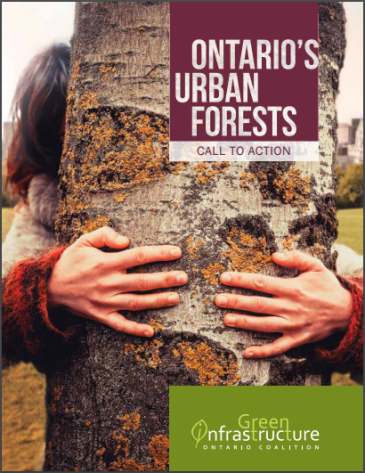 Ontario’s Urban Forests: Call to Action outlines the current issues in urban forest management in Ontario, and proposes four strategic priority areas for protecting and enhancing the vital green infrastructure that our urban forests represent. You can read about the call to action below, or download a copy HERE. 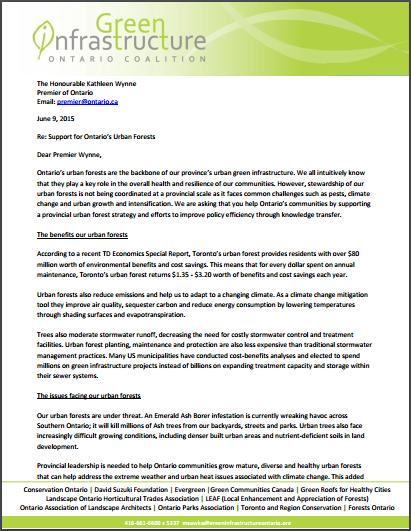 In a June 2015 letter to Ontario Premier Kathleen Wynne, we emphasized the benefits that urban forests provide, outlined the issues facing the urban forest, and suggested specific ways that the Province can support urban forest stewardship at the community level — namely, working with GIO to develop an Ontario Urban Forest Strategy, and supporting urban forest knowledge transfer. Read the full letter HERE. 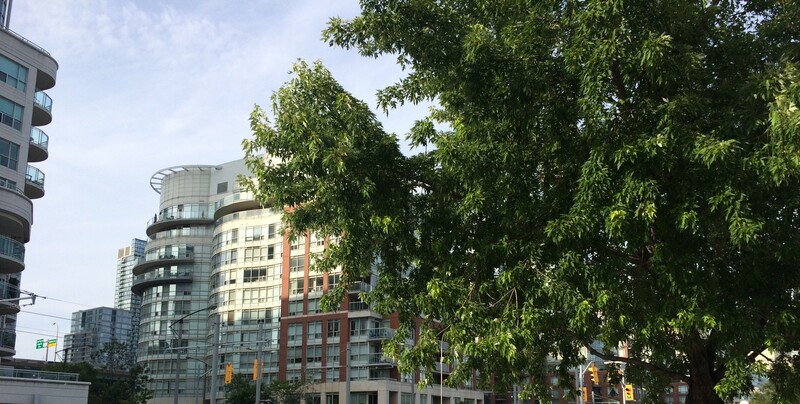 Ontario is the birthplace of urban forestry. The discipline originated in research conducted by Erik Jorgensen at the University of Toronto in 1965. His work represents the first recognition that urban trees provide environmental benefits in addition to amenity and recreational value. Now more than ever, there is a critical need to sustain large, healthy, genetically appropriate trees and shrubs on public and private land through long-term planning and budgeting, inclusive decision-making, and strategic policy development that supports adaptive management. Comprehensive urban forest support must extend well beyond tree-planting initiatives. Management of urban forests is often considered the sole responsibility of municipal governments. In reality, responsibility should be shared by private citizens, community groups, schools and other institutions, as well as industry and provincial and federal governments. Successful management frameworks must recognize that the urban forest is part of a complex system that includes the built environment, and is influenced by human activities and policies and practices that shape Ontario’s urban regions. To promote a collective agenda for necessary policy changes. To create a platform for collaborative action towards key strategic priorities. To support the exchange of resources, knowledge and expertise from across the province. Gain formal multi-level government support and funding for planning and managing the urban forest as crucial urban infrastructure. Document and maintain a current list of specific policy recommendations for the provincial government. Track progress on provincial policy recommendations. Encourage action on priority policy recommendations by developing and sharing consistent messaging for use by all stakeholders. Develop an advocacy toolkit to support stakeholders in their urban forest advocacy efforts. An online list is of provincial policy recommendations is utilized and contributed to by stakeholders and updated yearly. Progress is made and tracked on provincial policy recommendations. Useful advocacy tools are identified, developed, disseminated, and used by stakeholders in pursuing support and funding for urban forestry. Coordinate action in urban forestry at a provincial scale. Engage with the provincial government in the development of an Ontario Urban Forest Strategy. Conduct a scan of the current urban forest activities and associated operating environment in Ontario. Develop an interactive map of urban forest plans and strategies, and identify commonalities in vision, goals, barriers, and gaps. Build partnerships and alliances amongst municipalities, not-for-profit organizations, community groups, businesses, industry, and educational institutions. The provincial government takes a leading role in the development of an Ontario Urban Forest Strategy. An online network map is published, maintained, and utilized by urban forest stakeholders across the province. New partnerships are developed by implementing this Call to Action. Support municipalities, landowners, community groups and other stakeholders in managing Ontario’s urban forests. Demonstrate and share international and local best practices in urban forestry. Develop a toolkit of strategies for obtaining provincial funding for urban forestry through existing programs and policies. Identify mechanisms whereby the Provincial government can support the implementation of best management approaches to urban forest stewardship. Creation and distribution of a best management practices manual which is updated at least every five years. Stakeholders obtain funding for urban forest stewardship through existing provincial programs and policies. The province identifies a lead ministry for urban forestry and increases its support for municipalities and other stakeholders in the proactive management of Ontario’s urban forests. Undertake research and share knowledge, tools, techniques and information. Identify critical research questions and information gaps in the Ontario context. Create an urban forest centre for applied science and research which includes information for the general public and media. Develop citizen science and civic ecology tools that engage all residents in urban forest monitoring, stewardship and planning. Research gaps are continually identified and addressed through collaborative research. An urban forest applied research hub and/or centre is created (including strategic links to outside sectors). Research and tools related to urban forest planning, management, inventory and monitoring are readily available to all stakeholders.